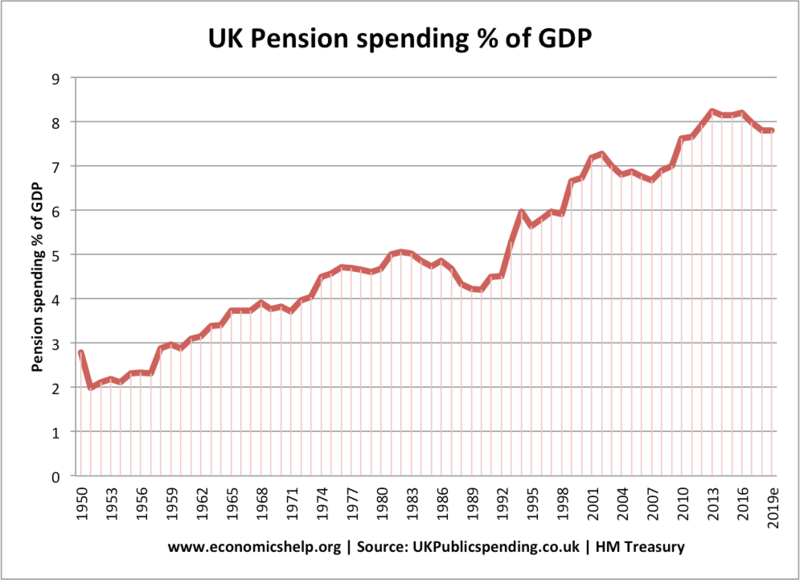 How UK Pension spending as a % of GDP has increased in recent decades. Option ONE Make people work longer. This could involve increasing the retirement age from 65 to 70. From an economic point of view this is beneficial because it leads to more tax revenue (people will pay income tax for longer) and more consumer spending. Also, the government can delay paying pensions saving substantial funds. Also, increasing the retirement age increases the supply of labour; this could be a benefit in labour markets where there is a shortage of skilled (experienced) workers. The main problem with this policy is that it will be highly unpopular, especially with people who are nearing retirement age. People may say the government is going back on its word to provide pensions at a certain age. In the UK, the government has pledged to increase the retirement age to 67, but this will not come in for a long time and therefore does not tackle the short-term debt. Another problem with increasing the retirement age is that it will affect different types of workers differently. A manual labourer will find it difficult to keep working until 70. But, for an office worker, it will be easier. Also, many well-paid workers will be able to afford to take a private pension early. If the government increase income tax rates, they will increase tax revenue to pay for the higher pension bill. However, higher income tax may lead to lower work incentives. It may discourage people from living in a certain country. Because income tax is relatively low in the UK, a higher rate may not reduce incentives that much; however, there is a high opportunity cost of taxing for pensions. Pension spending does not increase productivity in the economy. Option THREE - Means-tested pensions. Governments could make it obligatory for firms to provide a private pension. Alternatively, they could give more generous tax breaks for private pensions. This is good for reducing the government's pension burden. The concern is that some people may not have sufficient private pension provision when they retire. Therefore, there is still a need for government provided means-tested pensions. Immigration of young workers helps to reduce the dependency ratio and leads to higher tax revenues as young immigrant workers pay income tax and VAT without being eligible for state pensions. However, net migration can be politically unpopular as it places stress on stock of housing and other social issues. thank u very it has really helped me. you could also lower tax rates for families with two or more children. This would encourage families to have more children which would raise the number of young people and provide a stronger workforce later on.